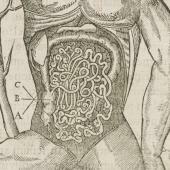 Knowledge of human anatomy had always been regarded as important to the surgical arts. 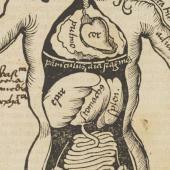 Manuals written by John of Arderne and by Henry de Mondeville, for example, gave concise descriptions of gross anatomy, but they were not always accompanied by images. 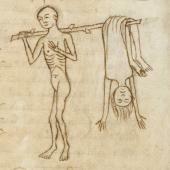 Some manuscripts did include illustrations, though of varying quantity and quality. 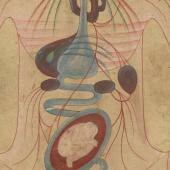 From the colourful scheme of a gravid uterus to a penned sketch of a droll figure carrying his own skin at only a couple of centimeters high, a range of images can be found in late medieval manuscripts. Some, though by no means all, printed anatomical books before 1543 also contained illustrations of varying quantity and quality, some of which were inspired by, or copied from works of art. These images were often limited in showing what was discussed in the text or sometimes even quite irrelevant to the content of the book. 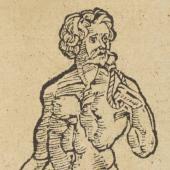 It also suggests the limitation of the medium of woodcut as a way of conveying anatomical detail as well as unwillingness on the part of an author or a printer to invest in a large number of woodcuts, perhaps influenced by the fact that these works were meant to teach the rudiments of human anatomy.